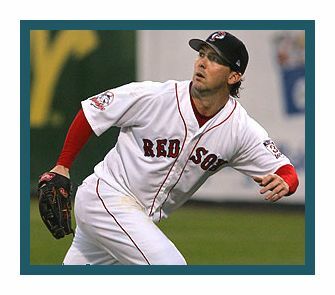 Trot Nixon played 12 years in the Major Leagues for three different teams but is best known for his play with the Boston Red Sox, where he was a fixture in right field for 10 seasons. He was among the most popular players in Boston due to his hussle and intensity. Trot attended New Hanover High School in Wilmington, North Carolina, where he was a two-sport star. As a senior, he was named North Carolina baseball Player of the Year and Baseball America’s High School Player of the Year while leading his team to a State 4A title. In football, Trot broke several school passing records and was offered a scholarship to play quarterback at North Carolina State. He gave up football after being selected by the Red Sox in the first round (seventh overall) of the 1993 MLB Draft. Trot’s first full season with the Red Sox came in 1999 after being called-up sporadically the previous two seasons. He had a career-best year in 2003 when he batted .306 with 24 doubles and 28 home runs. In game three of the American League Division Series that season, Trot was called from the bench as a pinch hitter in the bottom of the 11th. With the Red Sox facing elimination, Trot lined a two-run homer over the center field wall for a 3–1 Boston victory over the Oakland A’s. During the 2004 season, Trot was unavailable for several months due to a couple of injuries. Upon his return, he was the starting right fielder throughout the remainder of the regular and postseason. In the deciding game of the 2004 World Series, Trot hit a two-out, two-run double off the right field wall at Busch Stadium in St. Louis in the top of the third inning to give Boston a 3–0 lead. Those runs proved to be the difference as the Red Sox swept the Cardinals for the team’s first World Series title in 86 years. For the series, Trot batted .357 with three RBI’s. Trot endeared himself to Sox fans through his unwavering dedication to his teammates and by briefly wearing a mohawk hairstyle, one of the many unconventional hairstyles sported by the Red Sox over the course of the 2004 season. Trot also served as the inspiration for the expression ” Dirt Dogs”. The signature is that of a “scrapper”, a player who hustles and isn’t afraid to get dirty to win a game. Following the 2006 season, Trot was not offered salary arbitration by the Red Sox and signed with the Cleveland Indians, where he played for one season. In 2007, he played for the New York Mets and briefly signed a minor league contract with the Milwaukee Brewers before retiring.